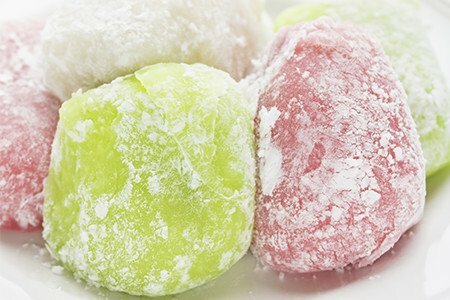 Mochi has become popular all over the world, and its popularity has made a variety of flavors possible and available. By importing a variety of different flavors into the same loveable package, mochi makers have satisfied millions the world-over. Countries and regions are generally loyal to the flavors that come from their local sources, and mochi makers have risen to the challenge. With a variety of flavors available all over, more people are connecting to the cuisines of different cultures by sampling them through mochi. The traditional dessert filling of Japan has not escaped mochi, or the rest of the world. The sweet, distinctively nuttiness of azuki (red bean) sets red bean mochi apart from the rest of the flavors. Red bean is Japan’s specialty, and has been available for hundreds of years in different types of Japanese pastries and dessert. From doughnuts to ice cream topped with the puree, red bean rules Japan, and tastes amazing. Though chocolate is made of cocoa, which comes from Mexico (or as the Aztecs called it, xhocolotl), it has been an American favorite for centuries. Chocolate is usually heavily processed, but retains many of its good qualities in organic chocolate bars. Vanilla also comes from Mexico, but both chocolate and vanilla can be cultivated from various African countries, and shipped all over. Whether they’re service individually or swirled together, chocolate and vanilla are the most beloved flavors in the United States, and considered classics. This attachment to classics extends to mochi. You may not find mochi in a root beer float, or sitting on top of a banana and topped with whipped cream, but you will find it pinched between fingers and going into happy mouths. The popular, hard-to-harvest fruit is beloved by Canada, the United States’ friendly neighbor to the north. Sales of strawberry mochi have always gone long and strong, and even overwhelm sales for chocolate and vanilla. Chocolate and strawberry may both have traces of vanilla, but their true flavors are always sweet, and vivid. Tiramisu mochi stole the heart of Italy by mimicking the creaminess of mascarpone and the zing of Italian espresso. Italy already has its hands full with gelato, their incredibly decadent and satisfying answer to ice cream. Tiramisu is probably only superseded by cannoli as the favorite dessert pastry of Italy. Tiramisu mochi is a great send-up to the classic Italian dessert, and you don’t even need a fork to enjoy it. Green tea and its dozens of varieties are practically synonymous with both Chinese and Japanese cultures. With flavor varieties like the grassy High Mountain Fog to the smoky Matcha and the slightly sweet Jade, green tea is a complex and highly variable type of tea with all types of flavors and degrees of bitterness. Green Tea mochi is usually modeled after Matcha in flavor, but disappears from shelves all over metropolitan China. Mango is the most popular fruit in the world, and the biggest exporters are China, India, and several countries in Latin America. Each country has their own way of eating and appreciating mango, and mango mochi is a great way to enjoy the flavor of mango without having to cut around the pilth.